Watercress is one of the first leafy green vegetables to find its way into the human diet. It’s nutritional value is cited in ancient texts in both Europe and Asia. It is botanically related to radish and mustard, unsurprising due to its peppery taste. At least 90% of the watercress found in Hawaii markets is grown locally. It’s nutrient content is high: vitamins A, B1, C as well as minerals such as calcium, iron, magnesium, phosphorous and potassium. – Always wash your watercress well before preparing. Dry in spinner or with paper towels. 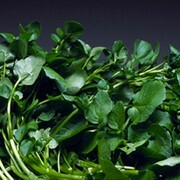 – Watercress can be eaten raw or cooked. – It makes bring a lot of zest and crunch to salads, makes a colorful accompaniment to sashimi, added to sandwiches, or juiced. – Watercress mellows in spiciness when cooked. It is often stir fried and added to soups. – It makes a great chilled side dish Korean style when it is chopped, blanched or parboiled, then squeezed dry and massaged with sesame oil, sea salt and toasted sesame seeds. A strong, vibrant green bunch is what you should be looking for. Take off wire tie, oak in bowl or bucket of cold water, then pat or spin dry. Watercress stores longer in the refrigerator when it is washed. Take off wire tie, soak in bowl or bucket of cold water, then pat or spin dry. Wrap in clean dry napkin, place in sealed plastic bag in the refrigerator. Will keep up to 4 days. Best to use quickly.